With a new, fourth star on his collar, Army Gen. John Abizaid took over as leader of the U.S. Central Command on Monday following a star-studded tribute to retiring commander Gen. Tommy Franks. 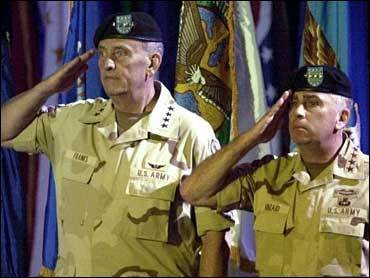 Abizaid, an Arabic speaker whom Defense Secretary Donald Rumsfeld called "the leader for the 21st century," had served as one of Frank's two deputies at Central Command. During that time, Franks planned the war on terrorism after the Sept. 11 attacks and then coordinated the invasion of Iraq. "The greatest honor of any solider is to command the sons and daughters of America," Abizaid said during the private ceremony. "It is a particular honor to embark upon this command in a time of war." Much of Monday's hour-long event served as a tribute to Franks. He was serenaded by country singer Neal McCoy with a number called "I'm Your Biggest Fan" and feted by entertainers Robert De Niro and Wayne Newton. He took over as chief of CentCom, headquartered at Tampa's MacDill Air Force Base, in June 2000. "When war comes, you look for certain special qualities in the people you'll be working with," Rumsfeld told the crowd of about 1,000. "Gen. Tom Franks embodies those qualities." Abizaid, grandson of Lebanese immigrants and a West Point graduate, led Army Rangers in the invasion of Grenada in 1983 and commanded a battalion that provided humanitarian relief in northern Iraq after the 1991 Persian Gulf War. He has also held two top positions for the Joint Chiefs of Staff and did a stint as commandant at West Point. "I know of no one more qualified to follow in Tom Franks' very large footsteps," Rumsfeld said. Abizaid (pronounced AB'-ih-zayd) was confirmed by the U.S. Senate last month and promoted to four-star general prior to the ceremony. Franks, 58, and his wife, Cathy, plan to retire in Tampa. "Today is very stressful time for me," said Franks, who is known for his dry wit. "When I woke up this morning, I had a Boeing business jet, several aides and several sedans. And now I'm worried about how the hell I'm going to get home."